An interesting accessory that can fit in any bag but it may prove difficult to use without a flat surface. Microsoft had a surprise accessory reveal during its conference at MWC and I got the chance to have some hands-on time with it. 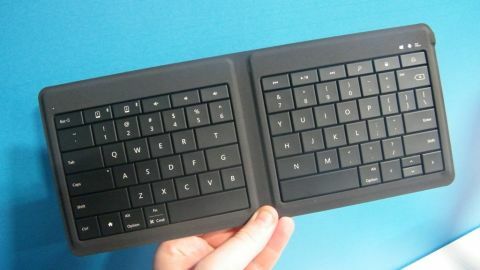 The Microsoft Universal Foldable Keyboard, possibly the catchiest accessory name on the planet, is a new Surface-like Bluetooth accessory that connects up to your phone or tablet for an easy to type experience. The QWERTY keyboard features keys of an average size to easily hit the right keys with your fingers and has the same feel when typing as the Surface's accessories have had. Function buttons on the keyboard are limited with volume keys sat along the top on the left hand side. The right hand side has top row buttons for music including play and pause, skip or rewind with a search button included as well. The keyboard then folds into two making it much easier to carry around as it's just a little bigger than a CD case. There's a magnetic strip running along the left and right hand side of the keyboard meaning when the two connect up together it's not going to flop open unexpected. Sadly we've yet to be able to connect it up to any devices so can't judge on how good the Bluetooth connection is. We do know it'll be compatible with all Windows Phone, iOS and Android phones though. The foldable aspect of the keyboard may prove its worth when trying to take it from A to B but it means there's a big fold running down the centre of the accessory. This split down the centre of the keys is also going to take some getting used to. There's two space buttons because of it as well as extended G and T keys that may cause some bad typos upon the first few uses. It's going to prove a problem when trying to type on any surface that isn't both solid and flat, meaning it'll only be useful in a limited number of situations. Microsoft has yet to reveal a price or release date for the new keyboard. If it is priced competitively it may be a good accessory to keep with you in case of emergencies, making word processing easier on mobile devices, but it isn't a replacement for a full Bluetooth keyboard.